Trance phenomenon Solarstone graces AVALON Hollywood with an Open to Close set. Hailing from the United Kingdom, Solarstone has been on a non-stop mission to bring his Pure Trance movement to the forefront of contemporary dance music. Equally, bringing the world's best talent to the nightlife of Hollywood has been AVALON's mission for over 10 years and this Open To Close will be a notch in the headboard of that goal. Solarstone AKA Rich Mowatt has been producing music since 1997, but shows no signs of letting up with his Pure Trance radio reaching over a 100 episodes, his involvement with ASOT, and more than a handful of timeless compilations. On the heels of his "Solarstone pres. Pure Trance Volume 7 forthcoming" 2018 proved to be another big one for the UK powerhouse and 2019 should be no different. 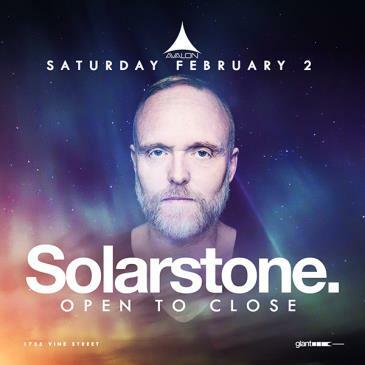 Expect an incredible journey of sounds with this magnificent open to close Solarstone is going to bring February 2nd.